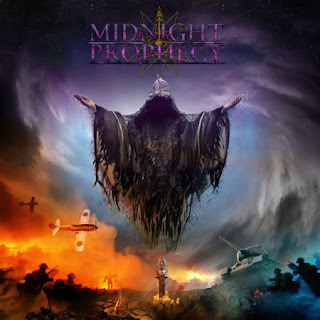 «Influenced by the Heavy Metal giants of the 80’s, Midnight Prophecy are making a name for themselves by taking the sound of the original heavy metal bands of the era and making it their own, and thus dragging the classic heavy metal of the 80's into the 21st century. Having recorded and released their debut self titled album; Midnight Prophecy are quickly establishing themselves as a must see Heavy Metal Band of 2018. Having already supported in their short career so far, the likes of: Anvil, Satan’s Empire, The Jokers: and chosen to support Diamond Head & Phil Rudd from AC/DC. Midnight Prophecy have been touring the UK from Newcastle to Birmingham and everywhere in between, promoting their debut album and supporting bands on the road from the likes of: Kaine, Vice, Twisted Illusion, Aramantus & Sertraline. European bands from Temperance and Disquiet, as well as: Evyltyde, Promethium, Novacrow, Tomorrow Is Lost, Witch Tripper, Voodoo Blood and Black Cat Bones. Their hard work is paying off, as they are creating a loyal fan-base where ever they travel to, which has led the band to make their first appearances at this year’s SOS Festival and Mosh Against Cancer Coventry. Lyric video: "Through The Fire"